Let’s start out with the bottom line. I love this album. 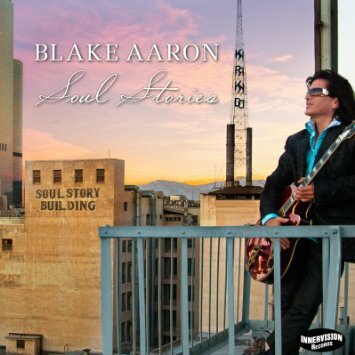 Guitarist Blake Aaron’s Soul Stories has already delivered three hit songs and every song on here has the same potential, it’s just a matter of how adventurous the ones who remain in radio want to be. 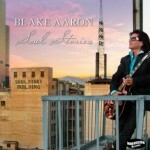 If anybody knows the territory covering rock, jazz, smooth and beyond it has got to be Blake Aaron. He has been on the scene as a session player, band member, and solo artist since the late 80s and has always had one foot ahead of the curve. He bravely released an album independently back when labels still ruled the world and has carved a career on the side hosting a radio show that gives him a chance interview musicians and showcase their work and I encountered him first as part of one of the dreamiest lineups ever when he was touring with Steve Reid’s Bamboo Forest in the early 2000’s where he was delivering rock guitar shreds and jazzy licks with sax man Will Donato and Reid’s amazing percussion kit . The diversity of his experience sets him up perfectly to deliver an album that covers a lot of territory and does it with such cliché busting originality that he can even bring new life to two songs that have been around for over 30 years and covered by everyone. Aaron’s radio sensibilities shine through on “Groove-O-Matic,” a jaunty, horn spiced jam with some tasty Benson – type flavor that keep it familiar sounding enough for airplay but give him room to open up and dive into some speedy soloing, especially toward the end. “Wes’ Side Story,” the current chart topping single has him paying tribute to the jazz guitar hero playing hollow body octaves over a driving rhythm section and again cutting loose with some tasty soloing in the middle. He flips from jazz to Flamenco in Sol Amor and jumps into a pool of breathtaking beauty on “The Story of My Life,” an acoustic ballad with soft samba shadings, Rob Mullins’ meditative piano textures and yes, an electric guitar solo in the middle. Then he mixes the Latin grooves with jazz chops on the other hit (so far), “Encantadora,” sharing the spotlight with Najee’s on flute. And oh, yes, there is rock, Bluesy and powerful on “The Story of the Blues,” and “Europa.” “Europa” has been covered much but it was a perfect fit for this guitarist and for an album that delivers fusion of jazz, rock, and Latin styles, and he owns it. Listen. With headphones. Played loudly. Choosing Spencer Day to do a vocal was a cool move too. “You’re the One for Me” is straightahead jazzy cool – piano, drums, bass and Aaron’s guitar punctuating Day’s snazzy delivery. This album plays out like a delightfully eclectic radio station that touches all the bases on the field known as jazz. There’s some fusion and rock flavor, Latin, Straightahead, Groove, Smooth, Soft, Funky, a bounce into familiarity as he rocks “Sara Smile” and even a wine and candlelight ballad “You’re My Miracle.” All strong songs, Soul Stories, from a killer musician and songwriter who I think is still severely underrated. He’s flown to #1 on some charts but charts are ephemeral these days. Blake Aaron should be shining with the genre’s biggest stars. Soul Stories is one enjoyable step in that direction.